AdvancedPRODUCTS are an ideal combination of products that work perfectly together to improve the papermaking process and maximize savings. 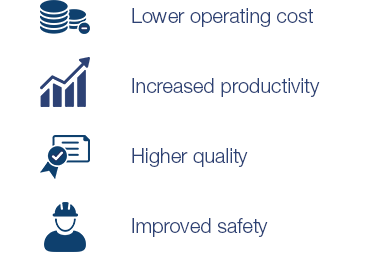 Voith provides its experience and knowledge to help you to achieve your targets. Maximize the performance of your paper machine with AdvancedPRODUCTS from Voith! high paper strength using a lower basis weight. Unique edge trimming concept saves fibers and increases paper edge stability. The shake unit to improve formation and save fibers. High open area and best fiber support for an optimized formation. Increase in efficiency through use of new dosing technology. Effective cleaning of forming fabrics. Reliable service for your equipment from initial installation to phase-out and replacement. Integrated Uhle box lubrication for uniform felt conditioning. Effective cleaning of press fabrics. Press fabrics designed for maximum dewatering capacity. Innovative sealing strip minimizes water consumption for all suction rolls. Reliable measurement of felt characteristics. Press roll covers for maximum dewatering efficiency. Effective cleaning of dryer fabrics. Repellant coating for guide rolls. Dryer fabrics for a cleaner surface and structure. A measurable value on demanding paper machine positions. Stable web pick-up and increased speed. The sealing strip holder for even higher vacuums.